Software Defined Storage (SDS) in the context of the Software Defined Data Center represents a new evolution in the storage industry that changes how storage will be managed and deployed in the future. SNIA defines SDS as: Virtualized storage with a service management interface. 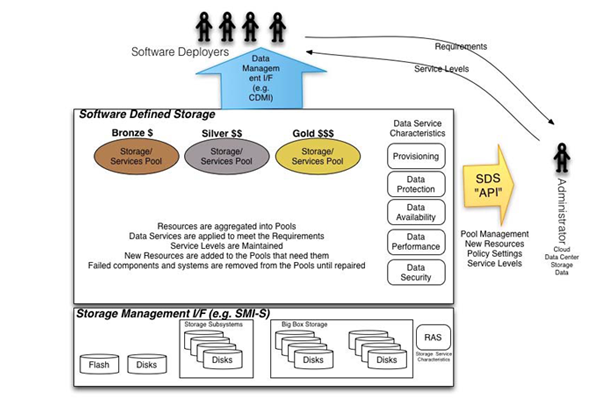 SDS includes pools of storage with data service characteristics that may be applied to meet the requirements specified through the service management interface. View more SNIA SDS educational resources. Storage Virtualization provides a capacity pool that can be structured into tiers and presented over an appropriate medium and protocol. SDS requires a standardized storage management interface, such as SNIA’s Storage Management Initiative Specification (SMI-S), in order to automate the management of the storage resources and discovery of their capabilities for use in various pools. SDS is an integral component of the Software Defined Data Center, it is the software brain for the storage and hardware infrastructure in the cloud or as part of a more traditional data center. SDS must enable DevOps to use a variety of data management tools to communicate their storage requirements through interfaces such as SNIA’s Cloud Data Management Interface (CDMI). Data Services can be executed either in servers, storage appliances, or both, removing the historical boundaries of where they execute. This diagram illustrates the concepts behind SDS.